“It’s beautiful!” Ok. That is reason enough to look at the dark sky. But, of course, there’s more to it. The good thing is that there is a lot more you can find out about the solar system just by looking at the moon and our closest planets with the naked eye! The image above is taken in western Finland on October 8th, 2015. When you read this, the moon will probably look somewhat different and be more “to the left”. Asking yourself “Why is the moon more to the left now than it was yesterday?” is a good starting point! Please observe that the formation of planets and the Moon above is tilted differently at different latitudes on the Earth. Directly opposite on the southern hemisphere. There are a lot of applications for mobile devices available to help you find out which planet is visible at the moment. Stellarium is a good one to use on a desktop computer. Here I’m using Stellarium screenshots to take a closer look at the view above. The Moon is lit up from the lower left. Obviously the Sun is about to rise over the horizon somewhere in that direction. 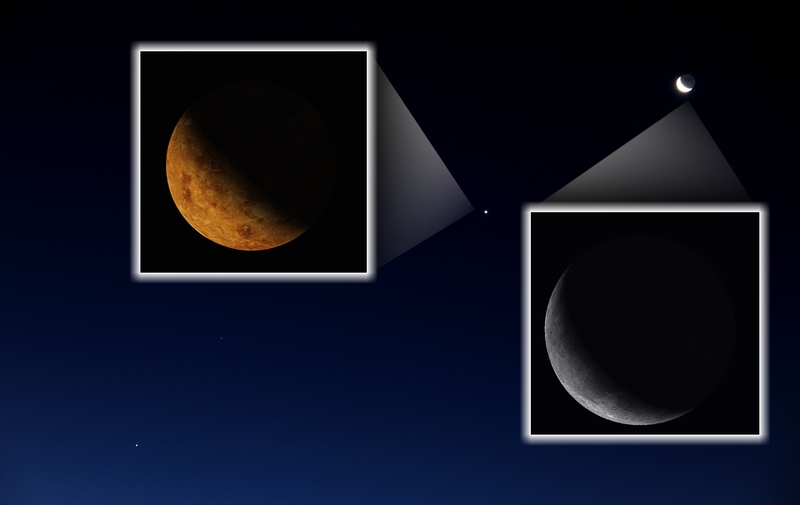 When we look at Venus, we see light from almost the same direction as the Moon. Venus is closer to the Sun than the Earth. That’s why it is possible to see it from an angle that results in a view like this. The only thing needed is a pair of binoculars or a telescope. Remember it was the phases of Venus Galileo wanted to show to the men at power – but they refused to look into the telescope. By looking at Venus – lit up from the left side during the period it rises ahead of the sun like a “morning star” and lit up from the right when visible in the evenings – it was obvious that the Ptolemaic system was to be out ruled. Anyway – almost half the planet Venus is lit up by the Sun. If you draw a line between the Earth and Venus and one from Venus to the Sun, these lines will meet at an angle not too far from 90 degrees. Mars is the faintest object in the row. It’s a small planet and for the moment quite far away. If you take a good look at the screenshot from Stellarium you see that Mars too is lit up from the left side but, unlike Venus, it’s almost entirely lit up. To see that, though, you need a good telescope. The gas giant planet Jupiter is down to the left. In the screenshot, you see the planet and the four Galilean Moons. They are not visible to the naked eye, but easy to find with a pair of binoculars or a telescope. These moons are interesting objects to observe without spending a fortune on equipment. Due to their short orbital periods they can be seen in a row at the same side of the planet one day and “in pairs” on both sides of Jupiter the day after. Back to the information you can reach just using the naked eye. 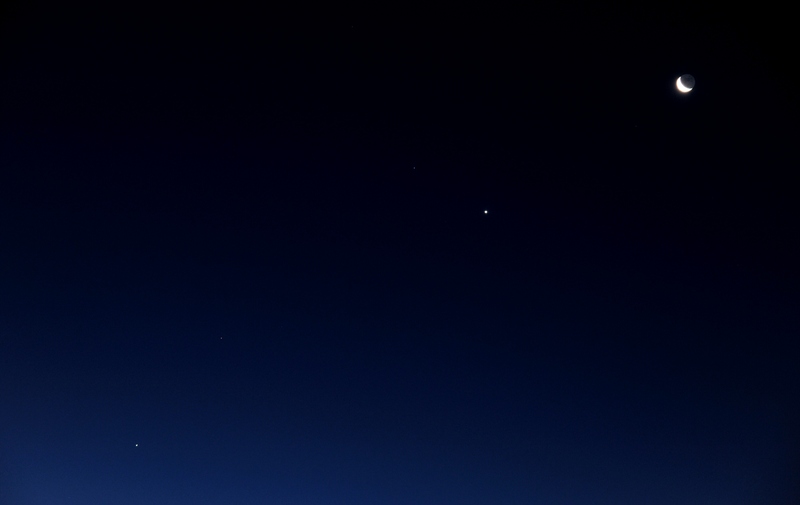 How can Jupiter and Mars be seen in the same direction as Venus? Venus’ orbit is closer to the Sun than the orbit of the Earth but Mars and Jupiter are in orbits outside ours. The reason is, of course, that Mars and Jupiter are on the far side of the sun. When Venus is clearly visible it can’t be in line with the sun. Therefore – when it’s well apart from the sun it must be quite close to half phase. I’ve seen questions about the solar system in math books used in schools today that assume the planets are fixed in a row like in most infographics. One example: “The distance between the Earth and the Sun is 150 million kilometers and the distance between Mars and the Sun is 230 million kilometers. What’s the distance between the Earth and Mars?” The right answer, according to the book is 80 million kilometers. 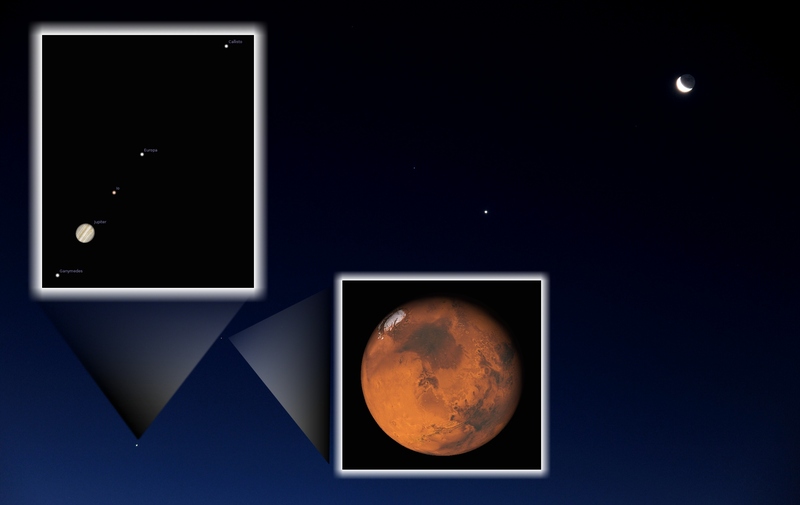 By looking at Mars, now almost in the same direction as Venus it’s not hard to figure out that the distance could be anything between 80 million and 380 million kilometers. 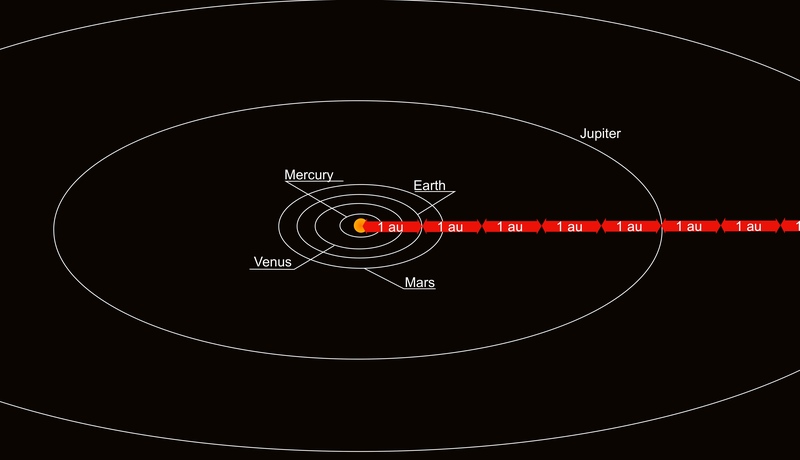 Jupiter’s orbit has a radius about four times the radius of the Earth’s orbit. Often mentioned as 4AU. One AU, Astronomical Unit, is the distance between the Earth and the Sun. Looking at the morning sky this October we can figure out that the distance between the Earth and Jupiter is anything between four and six AU. Probably close to six AU at the moment. Ready for some exercise? Look at the orbits. Where should you put the planets seen in the image on top of the page? Thank’s I’m glad you liked the post. I saw on your blog that you are studying to become an aerospace engineer. I sure will visit your blog. Yes I am! Hope you like it!